Emilie and Kate formed their duo while traveling Brazil in 2012. Twin sisters, Lydia and Maddy, have participated in a number of musical ventures together throughout the years. The two duos first met at Telluride Bluegrass Music Festival in 2013. A couple of years later, Emilie, Kate, and Maddy reunited in Austin to form Ley Line. Not long afterwards, Lydia also moved to Austin and joined the band, because she couldn’t stay away from her twin. All four women have traveled extensively, developing a curiosity about the world that is infectious. Singing in different languages (Portuguese, Spanish, French, and English) is a way for them to honor the places they’ve been, and keep the inspiration of those places alive in the present. Whether it’s connecting with larger audiences or playing music in a living room, the magic of Ley Line is that every performance feels intimate. In Austin, they’ve played Cactus Cafe, Sahara Lounge, Radio Coffee & Beer, GuanYin Tea House, and SquareRut Kava Bar. They’ve also given an outdoor candlelit performance at Barton Creek Greenbelt. 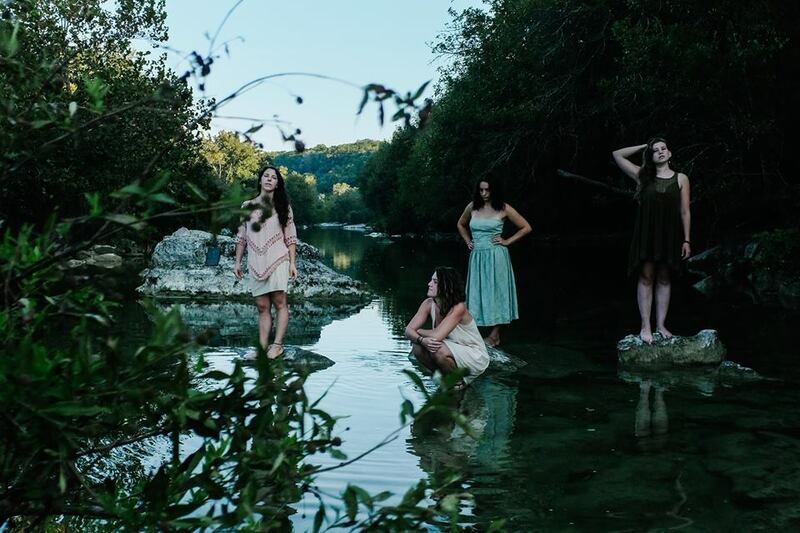 Ley Line has played Hill Country Fair in San Marcos and the 11th annual UtopiaFest. The group also curated the first ever Sonora Festival to take place in the United States. Sonora is a movement born in Brazil that quickly spread like wildfire around the world. It was founded to showcase female composers and musicians, empowering women in the arts and increasing their representation. This year, it was held at Cheer Up Charlie’s here in Austin. Ley Line’s incredible wisdom allows them to serve as educators for diverse communities. The band members often work with nonprofits, to help raise money and educate musically. Their most recent workshop, held at Pan Am Rec Center, was supported by Austin’s Cultural Arts Division. Along with other dancers and musicians, Ley Line guided participants through the musical styles of Brazil, Peru, Colombia, France, and Senegal before returning to the traditional folk styles of the United States. The band plans to incorporate similar workshops into future tours, visiting schools to share their love of music and culture with younger generations. Throughout its Brazil tour in 2017, Ley Line played everything from house shows, to pubs, to an artists’ co-op. The group was even invited to collaborate with a contact improv workshop that took place in a dome! The tour was self-managed, which is normally how Ley Line handles touring. It took an incredible amount of trust and hard work to map out the 3,000-mile journey, and translate everything to and from Portuguese. Although the band visited some of the same places Kate and Emilie had been to in 2012, much of the route was unfamiliar. Fortunately, many new and old friends supported Ley Line along the way. What’s Next for Ley Line? Stay updated on upcoming performances and tour dates by visiting Ley Line’s official website. Have you heard Ley Line yet?